Cocktail Chemistry: Parsing The Bloody Mary : Shots - Health News An analytic chemist has isolated hundreds of compounds that make up the world's most complex cocktail. He has some advice for amateur bartenders. You have no idea what's going on in that glass. The bloody mary, the signature brunch cocktail, had a friend in Ernest Hemingway. The famous writer bragged in a letter to Bernard Peyton that he introduced the drink to Hong Kong, and further claimed that "it did more than any other single factor except perhaps the Japanese Army to precipitate the fall of that Crown Colony." I don't know about that, but the bloody mary does seem to hold a special place on the menu. It at least appears to be a healthier option than most drinks (it's mostly tomato juice, right? ), and it's often touted as a hangover remedy. 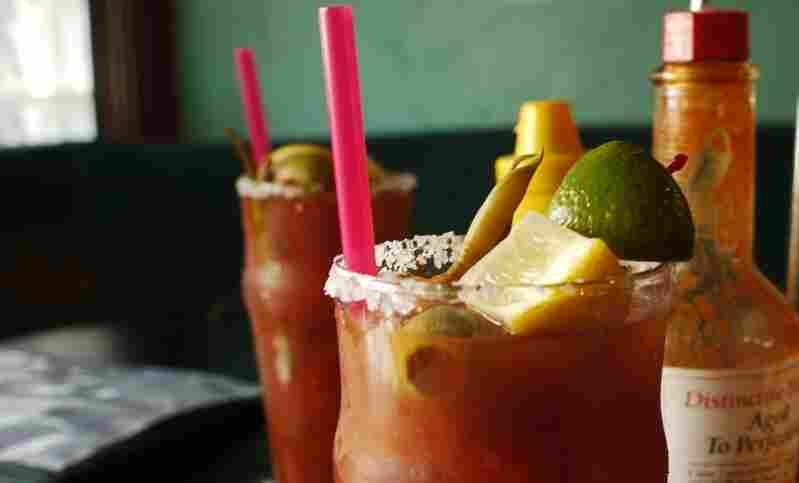 So how do you make the perfect bloody mary? Hemingway's recipe involved a lot of "tasting-as-you-go", and a long list of ingredients: vodka, tomato juice, Worcestershire sauce, lime juice, celery salt, cayenne pepper (modern bartenders usually substitute Tabasco sauce) and black pepper. "Each of those ingredients has tens of compounds, if not hundreds of compounds," Neil Da Costa, an analytic chemist working for International Flavors and Fragrances, tells Shots. "The bloody mary has been called the world's most complex cocktail." He should know. Da Costa has used every trick in the chemist's book to analyze each ingredient, and the cocktail as whole. He presented his findings at a meeting of the American Chemical Society this week. Da Costas, an expert in food flavors, is chairman-elect of the group's agriculture and food chemistry division. With gas and liquid chromatography, Da Costa isolated the wide variety of compounds that give the bloody mary its unique flavor. The drink covers much of the taste spectrum: sweet, salty, sour and umami — the savory taste of glutamic acid. And, Da Costa says, the order of these sensations is appealing: first cool and refreshing, then spicy, and finally a sinus-clearing horseradish kick. So what lessons can amateur bartenders glean from all this analysis? Make it fresh and make it cool, Da Costa says. Many of the ingredients are chemically unstable, so it's important to make your bloody mary from fresh ingredients and keep it iced to prevent deterioration. Hemingway would agree. He jotted down at the bottom of his recipe, "Whole trick is to keep it very cold." He went on to observe: "You can mix it so it will taste as though it had absolutely no alcohol of any kind in it and a glass of it will still have as much kick as a really good big martini." So if you're aiming for that perfect bloody mary, splurge on the tomato juice, not the vodka. You might not even taste the cheap alcohol. Neil presented his findings as part of the International Year of Chemistry a "worldwide celebration of the achievements of chemistry" organized by the UN and International Union of Pure and Applied Chemistry. "This was done to try and get chemistry to the masses," Da Costa says. "Anything you eat or anything you do - everything involves chemistry."